The ideal location for both business and leisure travelers. All guests enjoy a contemporary modern appeal from the moment you step in offering the true "home away from home" experience. The hotel is ideally located in the Stone Oak Business District boasting companies such as EOG Resources, Tesoro, Schlumberger, Microsoft, Baker Hughes and Airstrip just to name a few. Hospitals such as NE Baptist, Methodist Stone Oak and North Central Baptist are also within proximity of our hotel. Guests will enjoy full menu options for breakfast or dinner in Kem's Restaurant. Enjoy beverages in our relaxing atmosphere bar or rejuvenate in our indoor heated pool. We are located an easy nine miles from San Antonio International Airport and 20 miles from the historic Alamo and downtown Riverwalk. Attractions such as Six Flags Fiesta Texas, SeaWorld, Schlitterbaun Water Park, TPC San Antonio Golf and Shops at La Cantera are easily accessible. 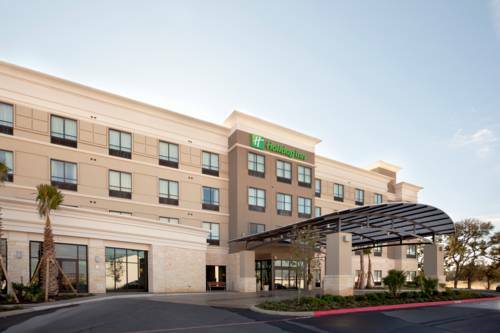 You'll see just how friendly our entire staff can be when you choose the Holiday Inn N. Stone Oak Area making your stay genuine and memorable experience. Board room has a non moveable table and it seats up to 10 persons comfortably. Perfect for small meetings or classes. Hill Country Ballroom C is one of three sections of The Hill Country Ballroom. Hill Country Ballroom B is one of three sections of The Hill Country Ballroom.